Attorneys for the Commonwealth of Kentucky have agreed to a deal with the Department of Justice, receiving $6 million from the “Black Friday”-related seized assets of Full Tilt Poker in exchange for Kentucky dropping its claims against four domains and the companies behind them that were seized by the US DOJ in April, 2011. The four domains — PokerStars.com, FullTiltPoker.com, AbsolutePoker.com, and UltimateBet.com — were among 141 domain names targeted by a Kentucky seizure order in 2008, though no actual seizure regarding the domains ever occurred in reality. Instead, attorneys for the Kentucky firm of Steptoe & Johnson, accepting the case on a contingency basis, filed a claim against the assets if the three seized sites in September, 2011. PokerStars eventually reached a settlement with the DOJ in 2012, through which it acquired the assets of Full Tilt and agreed to refund the balances of Full Tilt’s former American players, a process which has yet to begin. Absolute Poker, which also included the UltimateBet (later UB.com) site, went out of business without reaching any sort of settlement with US authorities. The Commonwealth of Kentucky and the Department of Justice will each be responsible for its own side’s attorneys’ fees as generated in the case. 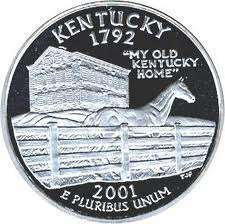 Kentucky agreed to be barred from any future action regarding the disputed and seized domains, and agreed that it shall not file any claim or petition for restoration or remiss relative to the Defendant Domains or the “Full Tilt Domain Substitute Assets,” the latter of which was used as the source of funding for the settlement. Kentucky agreed to drop its claims against the Full Tilt substitute assets (which by previous agreement, included its claim against PokerStars), and will have five days to dismiss its ongoing claims against the Absolute Poker assets. After that dismissal, the DOJ will have an additional ten days to remit the $6 million settlement to Kentucky. The settlement itself does not cause any additional impact on or reduction of funds already designated for repayment to the former Full Tilt American players. The $6 million comes from a $36 million fund previously agreed to be held in escrow, which was itself extracted from the PokerStars deal to purchase the Full Tilt assets. The net effect actually frees $30 million of that $36 million from legal limbo, allowing it to be absorbed into federal legal coffers. An additional $30 million of the $66 million initially placed into escrow remains under dispute. That fund is being held against the final third-party “Black Friday” claim to be resolved, an action for $10 million (with trebled damages) filed by Florida-based Cardroom International and its leading protagonist, attorney Cyrus Sanai, which alleged both an acquisition into Full Tilt ownership and damages to CI’s own poker-software marketing efforts toward major broadcast outlets including ESPN and FOXSports. We’ll have additional news on the Sanai situation in a very near-future post, in an action moving away from the poker world but still of interest to Black Friday readers.